Washington senior Omar Porter (13) drives between Lynchburg-Clay players on his way to the basket during a non-conference game at Washington High School Tuesday, Jan. 22, 2019. Pictured for the Mustangs are (l-r); junior Raymond Conner, junior David Giordano and senior Tyler Stevens. Washington (10-4 overall) got back on the winning track Tuesday, posting a 52-41 victory over the Mustangs. “I thought we were kind of looking to Jackson a little bit today,” Washington head coach Connor Scott said. “That’s our next game. It’s a huge game; it’s a grey-out here. “We started off slow on the defensive end,” Scott said. 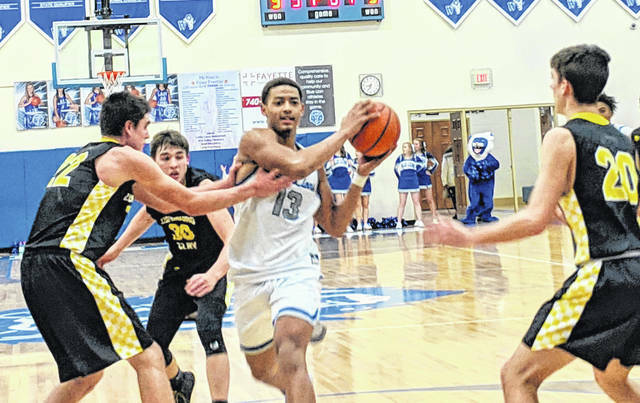 “We gave up 28 points in the first half (compared to 20 at Chillicothe Friday). That’s the point we made. I think when we want to defend, we can be elite. When we don’t, we’re not. “Garitt Leisure hit three threes in the first half,” Scott said. “He really carried us. Garitt was fantastic in the first half. He took great shots; got his feet set, did a great job and the shots were going in.” All of Leisure’s 16 points came in the first half. “I thought this game was the complete opposite of the Chillicothe game,” Scott said. “Against Chillicothe, we defended great, but couldn’t make shots. Tonight, we were making everything, but we couldn’t defend. If we put those together, we’re very good. “Evan did a great job leading us,” Scott said. “I think Blaise had 11 or 12 rebounds (which gave him a double-double). Richie probably affected 15 shots at the rim. He did such a good job of contesting the shot without fouling. Jackson defeated River Valley Tuesday night, 63-46 to improve to 11-5 overall. The McClain Tigers lost to Dayton Carroll Tuesday, 66-55. The Tigers are now 11-5 overall. WASHINGTON — Eli Lynch 0-0-0; Evan Upthegrove 1 (1)-2-7; Miguel O’Flaherty 5-0-10; Blaise Tayese 5-0-10; Garitt Leisure 3 (3)-1-16; Omar Porter 5 (1)-0-13; Drew Moats 0-0-0; Richie Burns 3-0-6. TOTALS — 16 (5)-5-52. Free throw shooting: 5 of 9 for 55 percent. Three-point field goals: Leisure, 3; Upthegrove, Porter. LYNCHBURG-CLAY — Andrew Cumberland 2-0-4; Noah Miller 3 (1)-1-10; Blake Marcelino 0-0-0; Tyler Stevens 0-0-0; Ray Conner 7 (1)-4-21; David Giordano 0 (1)-3-6; P.J. Fiscus 0-0-0. TOTALS — 12 (3)-8-41. Free throw shooting: 8 of 16 for 50 percent. Three-point field goals: Miller, Conner, Giordano.